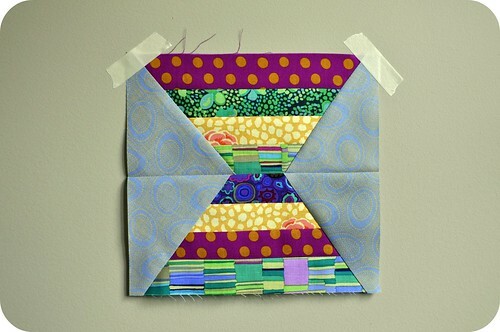 Hello, and welcome to everyone participating in Jackie's Blogger's Block of the Month quilt-along! 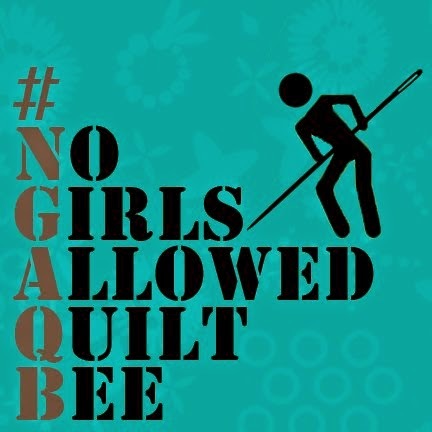 I've really enjoyed seeing the designs that have been posted so far, as well as all of the fantastic blocks filling the quilt-along's Flickr pool. I'm excited to bring you January's block, the 5th block in the program. Because it looks like an hourglass, I call it the Sands of Time block. Finishing out at 8" square (8.5" unfinished), it's a quick & easy block to make -- something I thought you'd all appreciate as you catch up from the holiday rush. Ready to get started? Here we go ... ! First, cut 8 - 1.5" x 8.5" strips from assorted prints. You don't necessarily need 8 different prints -- you can see that I used 5 prints here, and just repeated 3 of them. 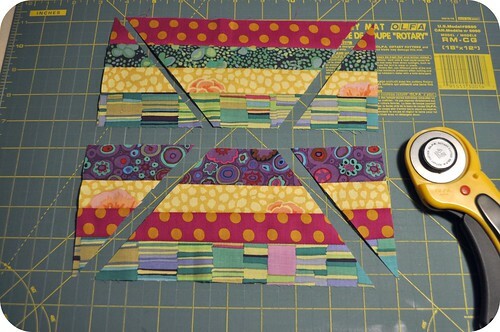 Sew the strips together into two sets of 4 strips each. This will yield 2 rectangles, each measuring 4.5" x 8.5". Find the spot along the bottom edge of your first rectangle that is 3" in from the left hand side. Mark it lightly with a pencil. Using your rotary cutter and straight-edge ruler, make a cut from the top left corner of the rectangle to your pencil mark. Repeat on the right side of your rectangle, making a slice from the top right corner to a mark along the bottom edge that measures 3" from the right side. This sounds really confusing, but just take a look at the picture below. It's way easy, and only sounds complicated. As you can see in the photo, you'll do the same steps with your second rectangle, but this time you'll be measuring in 3" from the left and right sides along the top edge of the rectangle, and cutting from the bottom corners. See? It's actually very easy. 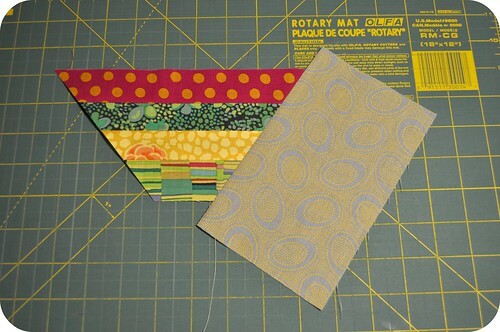 OK, from a background fabric, cut 4 rectangles measuring approximately 4" x 6". You'll see in a moment why it's not important that the measurement is exact, as long as you have enough surface area to square up the block later. If (unlike me) you're obsessive about not wasting fabric, trial & error should help you determine the exact measurement that you'll need to minimize waste. 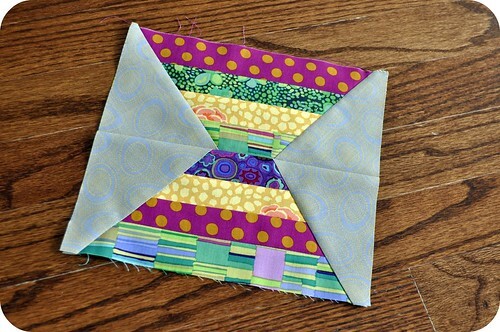 With right sides together, sew the rectangle to one side of the trapezoid, and press open. 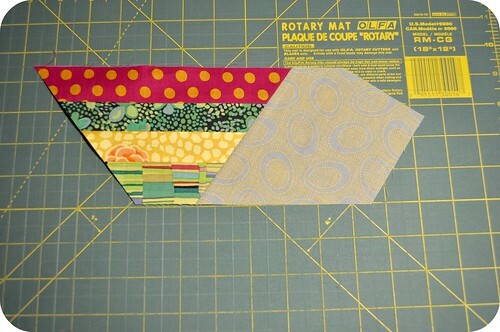 With your ruler and your rotary cutter, and using the top and bottom edges of your trapezoid as a guide, trim the edges so that the height of your pieced block is back to 4.5". 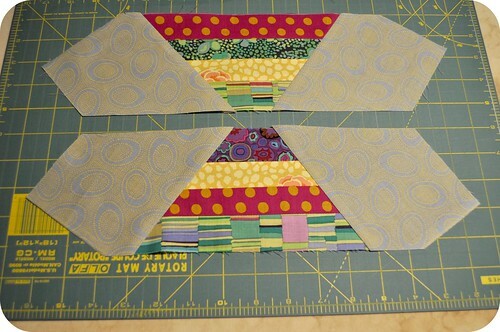 Line up the two smallest strips and, with right sides together, sew the two pieces together. Press open. 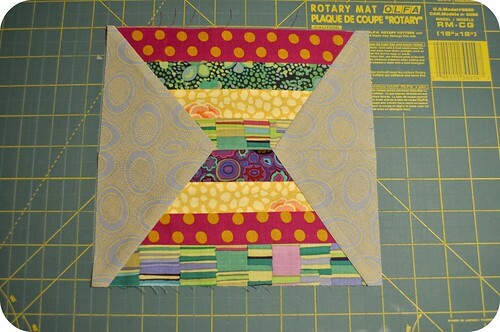 The height of the pieced block should now measure 8.5". Now all you have to do is trim the width of the block down to 8.5". Be careful to center your block as best you can. The block should now measure 8.5" square. And there you have it -- my scrappy Sands of Time block! I hope you enjoy making this block, and I can't wait to see all of your color and print variations. If you make a Sands of Time block, be sure to add it to the Blogger's BOM Flickr group. 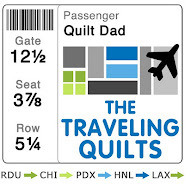 And, of course, I'd love it if you also added it to my Quilt Dad is my Homeboy group. Great block, John! And a great tutorial! Thank you so much for being part of this fabulous group of designers! very nice block, like it! Looks cool! Can't wait to get to it! Thanks, your block is really cool. I will make mine tomorrow for sure. What a fun block! I'll get mine made us soon. It looks like you guys are having a great time at this. One of these days I am going to have to go back and read them all and try my hand at them. Fun way to make those side pieces work with your Block. Very Scrappy! Very cool block, I really love the scrappy look! Ouuuu, do I love this block! 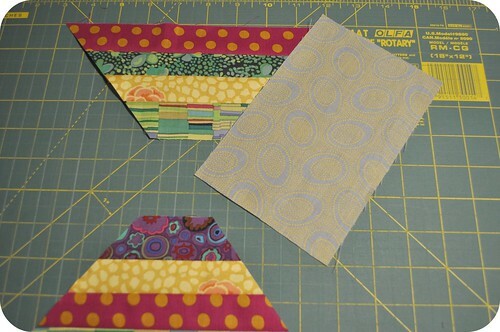 I love how using all the fabrics in my previous blocks can all come together in this block. Thanks, John! Love your block! 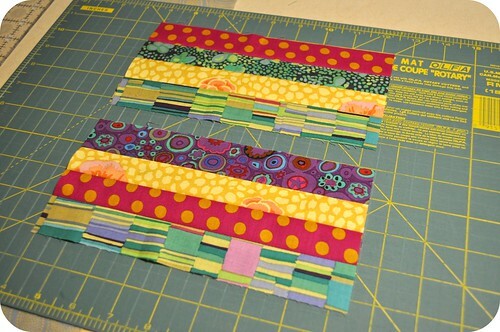 Definitely want to make a queen size quilt in your blocks. Can't wait to see how it turns out. Also love the Kaffe fabrics, I am thinking I will use those also. I am becoming a follower of your blog, for sure. Thanks for the awesome block. Awesome block! I just finished sewing mine and posted to Flickr. Thanks. Hello! Thanks for sharing another great block. I always find your designs so fresh and the tutorials you provide make them super easy to follow along with! Thanks for the great block. About to start now. Thanks for a fun block John! I just finished 2 of them. What a cool blog, John. I'm now a follower. And I just wanted to add that I grew up on Lake Wheeler, not far from you. Blessings! Very nice!! I will have to try that. How many people who said this is a great block have actually made this block? Mine did not work out to 8.5 inches. It is only 7.5. I don't sew at a scant 1/4 inch and the directions didn't say scant so I sewed at my usual 1/4 inch. Did anyone else have trouble with this block? 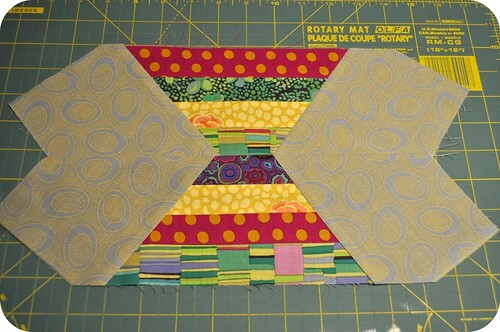 I have not yet made this block, and I am somewhat of a beginner - but it seems that the disguarded pieces could be used as an alternate block? I like this block because it is unusual. I will probably make it. What do you do with your scraps? I like quilts that can be easily hand quilted.